With WSS 3.0 and MOSS 2007 you can develop web parts which can be connected together as providers and consumers. WSS 3.0 and MOSS 2007 now uses the .NET 2.0 connectable web part technology. This sample demonstrates a consumer webpart which will consume row data provided by OOTB web parts using the standard IWebPartRow interface. Custom developed web parts can implement their own connection interfaces of course, but the advantage of using the standard interfaces is that they can be integrated with the OOTB ones. 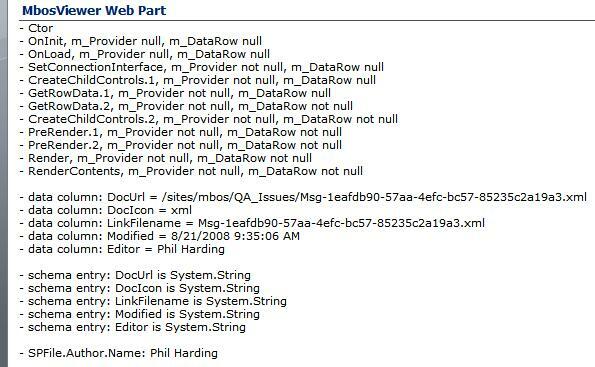 The IWebPartRow interface provides access to a row of data provided by the provider web part. Using the OOTB List View Webpart (the standard webparts which represent standard and custom lists / document libraries) as an example provider, these web parts view list data using one of the views attached to the list (and you can customise the web parts copy of that view also). So in terms of a row of data, a provider such as this will offer the currently selected row in the providers view. The contents of this row (i.e the columns) are the list columns selected for display in the web parts view. If the list is a Document or Form library their will also be a column called DocuUrl, which is the site relative url of the Document/Form library items SPFile. If the list is just a list, their will also be a column called Attachments. Changing the columns displayed on the provider web parts view, then, obviously changes the data row columns offered to consumers. As far as web part life cycle events go, things follow the normal web part life cycle model (see this post), however, the call to SetConnectionInterface() follows OnLoad(). This call connects the 2 web parts, but no data has been transferred as yet. It turns out that the data transfer action follows a pull model (from the consumers point of view) and it is the consumers resonsibility to pull the data from the provider as and when ready. The consumer can pull the data from the provider whenever they require, except that it can obviously only be done after the SetConnectionInterface() method has been called. To retrieve the data, the consumer makes a call to _provider.GetRowData(callback_method). The callback_method is implemented in the consumer code, the single parameter to this callback method represents the row data and must be cast to the required type. Note, that the provider calls the consumers callback_method synchronously. The consumer web part developed here will be connected to a Document library list view provider shown below, note the columns displayed on the view. When connected to this provider web part, the consumer displays as follows. The code for the consumer web part is show here. (I am an absolutely web part developer beginner !). I have copied your code into a VS 2008 web part project, compiled and deplyoed – no apparent problems. I have connected the web part to an OOTB DataFormWebPart exposing items from a SP list. So far so good or ? But when I click an item in the DataFormWebPart one of the usual no-good error messages shows. Do you have any suggestions as how to fix this ? Have you turned off friendly error messages to see what the exception information is? I experienced the same problem with the unexpected error when trying to consume data from an OOB Data View Web Part. After much digging, I finally discovered that if you inherit from “Microsoft.SharePoint.WebPartPages.WebPart” instead of “System.Web.UI.WebControls.WebParts.WebPart” it works as expected. I can only speculate that there is some legacy reason for this. Jordan, thanks for the tip. I’m trying to add a Button to the consumer webpart. When this button is clicked I want to use data from the provider. But for some reason when I click the button in the myButton_Click method the object DataRow is allways null at this stage of the lifecycle. Do you have an Idea how this can be resolved?